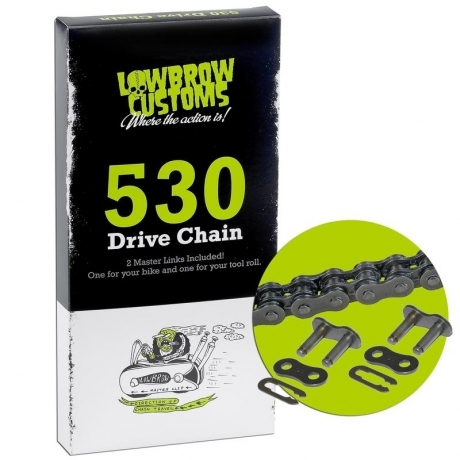 Need a 530 chain for that street-pounding freedom machine? This one is a 530 series chain that is 130 links long, good for stock use or on that stretched out chopper (we recommend 130 links for a 4" stretch hardtail). The icing on the cake is that we included two master links, one for installing your new chain, and the other for keeping in your tool roll or garage as a spare. That's good stuff. Our buddy Maxwell Paternoster even did a nice little illustration to remind you which way the master link clip goes, he's so very safety-conscious. 530 Цепь - 120 с 2 мастер линками 2110грн. 4960руб. 74.00usd.